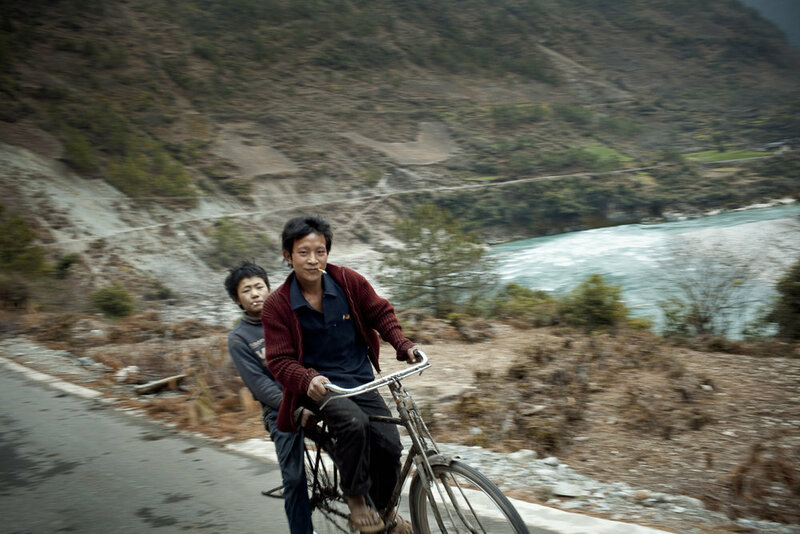 Nujiang, Yunnan: The Nu is one of China's last free flowing rivers but changes are planned. Dam construction has been suspended due to public activism. Its one of the rare examples where civic groups have been successful in slowing the construction of dams in China. Qiunatong Village, Yunnan. The road from here leads directly into Tibet. Small villages along the Nu River are often defined by one ethnic group. Qiunatong is a Nu Village with about 200 people. In general these places have little public infrastructure including electricity and waste treatment. Qiunatong, Yunnan. A child reads near what will be New Year's Eve dinner. The village is primarily agricultural. Qiunatong Village, Yunnan. Most of the minority groups converted to Christianity a hundred years ago when missionaries crossed over from Burma. Villagers gather for a late night mass on New Year's Eve. Qiunatong Village, Yunnan. Nu villagers gather at a home to drink and dance. At midnight on New Years Eve everyone was supposed to drink spring water but most never made it out of these house parties. Qiunatong Village, Yunnan. After midnight mass villagers go home to start celebrating by dancing and drinking local spirits. Bingzhongluo, Yunnan. Bingzhongluo is the first town along the Nujiang as it flows out of Tibet. The town is the center of a national park and has great potential to become a tourist destination. It sits on the first major bend of the river and is surrounded my mountains, villages and trails. Wuli, Yunnan. A Tibetan man gathers pine needles for Buddhist rituals. While many Tibetans in this region have converted to Christianity they still maintain some of their traditional culture. The pines needles are put around Buddhist shrines and decorate the entry way to their homes. An old bridge between Qiunatong and Wuli, Yunnan. A new bridge sits alongside of the old one. As tourism becomes a more important part of the local economy the government is making improvements to the local road system. Villagers and tourists who would have come here a few years ago would have needed to walk or use a four wheel drive vehicle. Now there is van service as far as Qiunatong. Wuli, Yunnan. The path to Wuli is carved into a mountainside along the Nu River. These tourists have come from Shanghai during their Chinese New Year holiday. As opposed to most of the minority villages in the area who have converted to Christianity Wuli is still a Tibetan Buddhist village. Dimaluo, Yunnan. Dimaluo is a Tibetan Catholic village on a tributary to the Nujiang called the same name. The villagers celebrate New Years by drinking corn based alchohol, singing Tibetan songs and dancing. For Tibetans in this area its a challenge to maintain their cultural practices and language. Since the area is only partially Tibetan the schools don't teach Tibetan language or culture. Dimaluo, Yunnan. 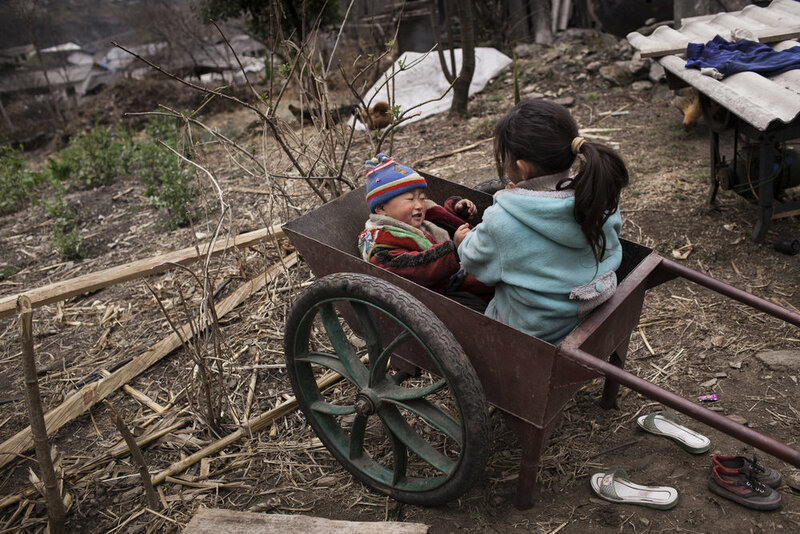 Two Tibetan kids play in their backyard. The village sits just upstream from a new dam. Though not yet operational local people don't voice much support for the building project or its long term effects. Dimaluo, Yunnan. Looking out from a Tibetan home. Tibetans use many forms of plants in their rituals including juniper, willow and gardenias. Though the village is Catholic there is a concerted effort not to lose their Tibetan heritage. Since their village is outside of Tibet, schools do not use Tibetan language or teach Tibetan culture. Families on their way back to Baihanluo after celebrating Spring Festival in another village. This village sits on top of a mountain and like Dimaluo is a Catholic Tibetan village. This pack train is bringing supplies up and some are making New Years visits. Arriving in Baihanluo, Yunnan. Seeming remote and only reachable by foot or horse this village has a century old Catholic church and a full basketball court. The mountain passes in this part of Yunnan have been used for generations as a trade route through Tibet and Burma. Baihanluo, Yunnan. 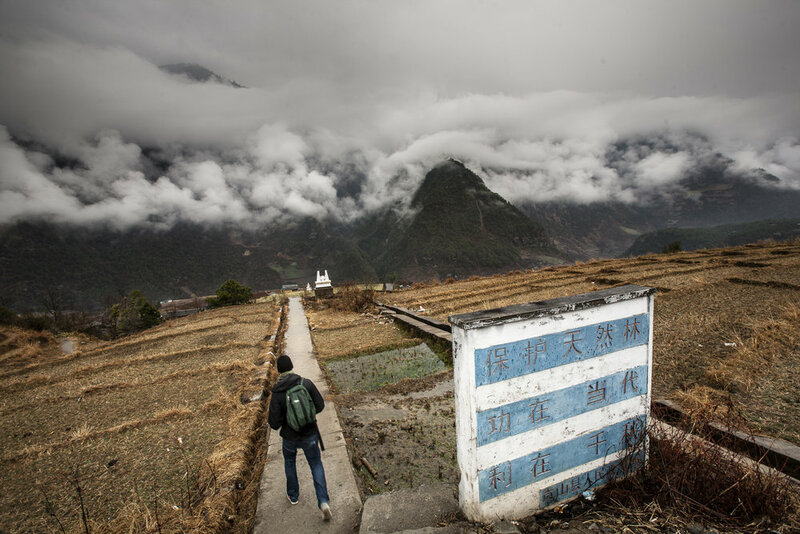 This mountain top village is home to a Tibetan Catholic community. Near Liuku, Yunnan. The Lisu people celebrate the New Year by taking ritual bathes in natural hotsprings that are found in this geo-thermally active area. This spring is public (many have been made into private sites) and sits along the Nujiang. It will be submerged when the dam projects proceed. This site just north of Liuku is in the catchment of what might be another large dam along the river. These two women are from the only relocated village. When the dams were still being built their village was relocated off the river to new town away from their fields. Beipang cun, Yunnan. On the left, a village elder and leader sits for a portait in the local temple. This temple is 160 years old and has never been renovated. On the right, a detail shot of the temple's entry way. Beipang Cun, Yunnan. An old farmer walks through his fields.